When I first moved into my neighborhood, many years ago, there was exactly one place to eat (at night, anyway): a hipster burger place called Planet Cafe. A few weeks later I was exploring the area further up Lincoln, and spotted a picturesque Italian restaurant, rambling over two or three storefronts and bathed in a warm, welcoming Tuscan light, called La Bocca della Verita… the mouth of truth. At the sight of it my heart ached with jealousy— why didn’t my neighborhood have one of these? The oh-so-life-in-the-big-city neighborhood Italian joint, presided over by the sturdy Italian mama and making comfy plates of what we then all called Northern Italian food. (Though we didn’t really know what that meant, except things did have basil scattered on them, and didn’t come buried in the lead weight of old school red gravy.) For me, at that time, it represented everything about what life in the city was supposed to be– cosmopolitan, continental, yet cozy at the same time. It was right up there with used book stores and the three-story Rose Records and checking out tiny theater troupes for $7 a ticket (anyone else see The Book of Blanche?) and art movies at the Fine Arts, among things that were What I Moved To This City For. But as Tony Soprano said, remember when is the lowest form of conversation. So I’ll simply note the disappearance of nearly everything on that list except La Bocca della Verita. 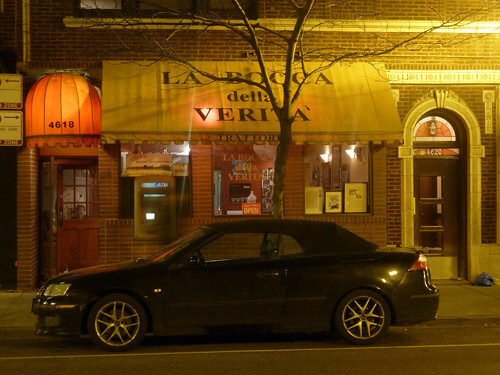 When I moved here, youthful Kansas emigre, I didn’t know Italian food from Franco-American spaghetti, so a return to La Bocca della Verita after many years was fraught with opportunities for you-can’t-go-to-your-old-new-home-again disappointment, except my expectations were fully primed for exactly that. And they were mostly right. If I know what the delicacy of Italian food is now, what subtlety is, I also know when it’s being made without them. And the food my younger son and I had was, what’s the nicest way to put it, pleasantly clumsy. Gooey gnocchi with trumpet blast tomato sauce. Gluey spaghetti carbonara with guanciale which was flavorful… including the flavor of smoked pork, which guanciale doesn’t normally have. Baked cod in a pool of lemony, garlicky liquid being the best of the evening, but still, most reminiscent of the days when I would be taken to lunch at Riccardo’s, an ancient downtown advertising hangout, and quickly learned to stick to fish as the thing they could damage the least. I could name better renditions of everything we had. I could imagine someone else getting all Medici on this kitchen. But… it won’t be me, because their welcome to this bustling restaurant could not have been friendlier. The sturdy Italian mama’s smiles and consideration for my son’s wellbeing (even if it meant offering him a 7-Up refill he definitely didn’t need) were pleasures of life and community beyond mere gustatory pleasures. I don’t live in this neighborhood, I am no longer the starry-eyed youth, but for one night again, I felt the palest ghost of long-ago excitement at having places like this— real Italian restaurants, run by real Italians, everybody welcome— just a stroll away on the streets of my new metropolis. So here’s a kiss for La Bocca, and let cold hard Veritas take the night off. 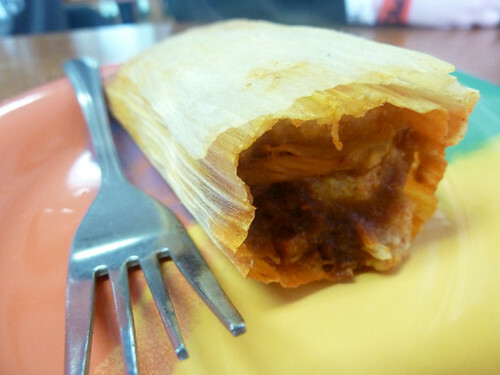 Pork tamale from Tamales lo Mejor de Guerrero. Aren’t those quiche at Nightwood something special? That’s pretty much the only place I’ve eaten in the last six months, so I can’t speak for anything else (although being a former Montrealer, that pastrami is calling to me; Nightwood’s squab pastrami just didn’t do it for me).